Financial Aid: Merit scholarships up to $24,000 USD; approximately 90% of students receive need-based financial aid and merit scholarships. With 2,400 students from all over the US and world majoring in more than 50 traditional and interdisciplinary areas of study, Universityof Puget Sound graduates students who go on to work for companies like Apple, Amazon, Boeing, Coca-Cola, Google, and many others. Graduates also enjoy an over 80% acceptance rate to medical and law schools. Ourinternational students dive into campus life when they get here, and many take advantage of international student services like our international student–mentoring program and internationally focused flats in Thomas Hall. Located near the urban heart of Tacoma in the North End neighborhood, the Puget Sound campus is within walking distance to some of the best shops, eateries, and coffeehouses in the city. 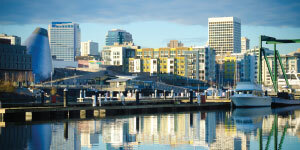 Tacoma is in one of the most diverse areas of the Pacific Northwest, and campus is a bus ride away from several live music venues, movie theaters, and museums, including the Tacoma Art Museum and Museum of Glass. Add to that the magnetic pull of Mount Rainier, beaches found in nearby parks, and rainforests on the Olympic Peninsula, and it won’t take long to create a four-year agenda not just of outings but also of research experiences, including studying anything from the geochemistry and origin of hot springs in the region to the industry of Tacoma. Placed in the top 20 for “Most Accessible Professors” by The PrincetonReview, Puget Sound kindles a passionfor discovery through small class sizes,internships, scholarship, and research.An 11:1 student-faculty ratio meansstudents receive lots of personal attention from the more than 200 faculty members who teach 1,200 classeseach year. Teaching is a priority forfaculty members, who take a collaborative approach to learning and aregenerous with their time. Beyond the classroom, learningcontinues at Puget Sound with programs in residence halls that create a 24/7 living-learning environment and extend to over 100 study abroad opportunities in more than 40 countries. 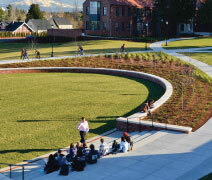 Puget Sound was named one of America’s top 20 entrepreneurial colleges by Forbes magazine. Studentscan join our prestigious Business and Leadership Program and study everything from Biochemistry, Neuroscience, and Environmental Policy to International Political Economy (a field that was started at Puget Sound), languages, and literature. Students can also study Engineering through Puget Sound’s 3-2 program, where students spend three years at Puget Sound and finish their degree at one of our three partner schools: Columbia University, University of Southern California, or Washington University in St. Louis. With a School of Business and Leadership and a selective, hands-on Business Leadership Program that accepts up to 25 first-year students each year; a School of Music; and graduate programs in Occupational Therapy, Physical Therapy, and Education,Puget Sound offers a liberal arts education that prepares students to makea difference in the world. Ranked in the top 10% of colleges for students who earn doctorate degrees, Puget Sound has a commitment to lifelong learning. Students go onto graduate programs and careers inevery known field of endeavor, including medicine, law, finance, media, education, the arts, and public service. They attend top graduate schools including Harvard, Oxford, the University of Chicago, and Stanford; they win competitive fellowships including Rhodes, Watson, Fulbright, and National Science Foundation awards; and they work for the Peace Corps and Teach For America. Closer to home, the Tacoma Art Museum, Tacoma Actors Guild, and Symphony Tacoma all trace their origins to Puget Sound students and faculty members. Helping students get here is a priority for Puget Sound—all international students who apply are automatically considered for academic merit scholarships rangingfrom $13,000–$24,000 USD a year, renewable for all four years. International students with top academic credentials are invited to apply forthe prestigious Lillis Scholarship, a full-ride scholarship covering tuition, room, and board. Find out more about the Puget Sound experience, how to get here, and what it’s like to be on campus at pugetsound.edu/internationaladmission.